Big List Of Exotic Fruits! 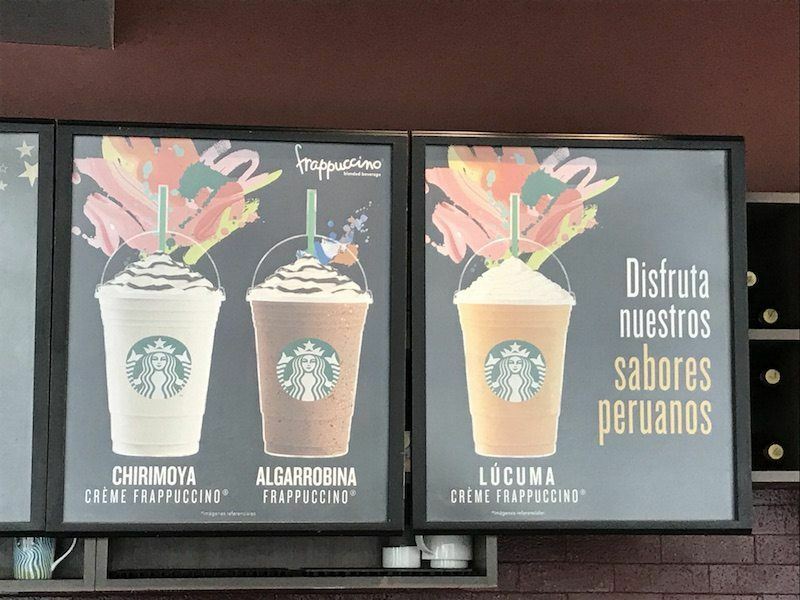 After my trip to Peru to see Machu Picchu in May 2017, I discovered a bunch of new fruits. 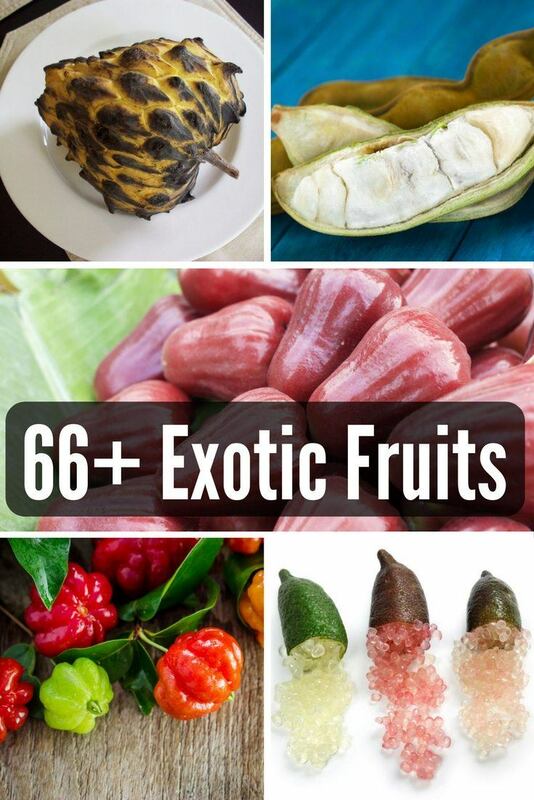 It just goes to show you that even these 66 fruits (now 68) is just cracking the surface of what's out there. 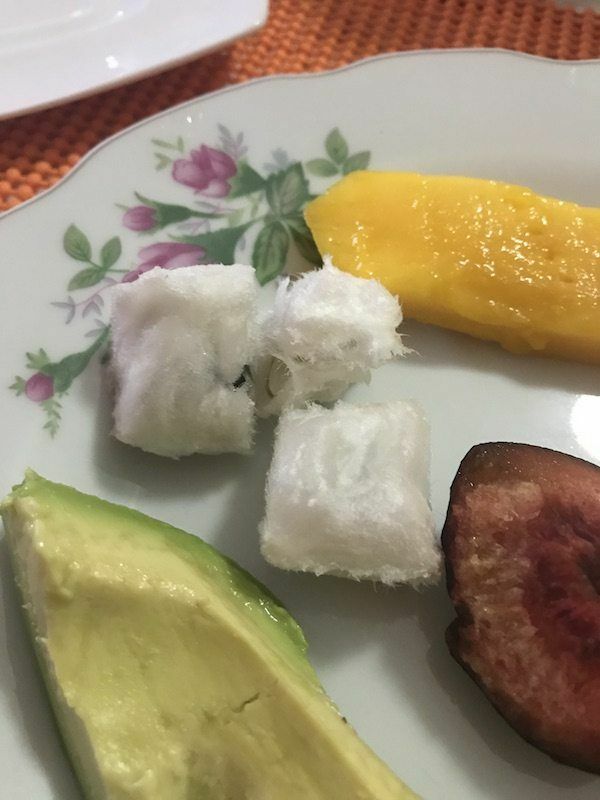 According to Peruvians, most people don't actually eat this fruit, but they really enjoy the flavor of it in other things. The texture isn't very pleasant according to the people I asked, but it's sweet! They put it in cakes, pies, pastries, puddings, ice creams, and other sweets. Actually, my first time learning about it was in a local Starbucks! You can't get this in the USA for sure! I usually don't drink Frappuccino's, and it was way too sweet for me. I couldn't finish it. But I saw tons of people order it, so it must have been popular. The chirimoya (white one) is featured lower on this list as well. 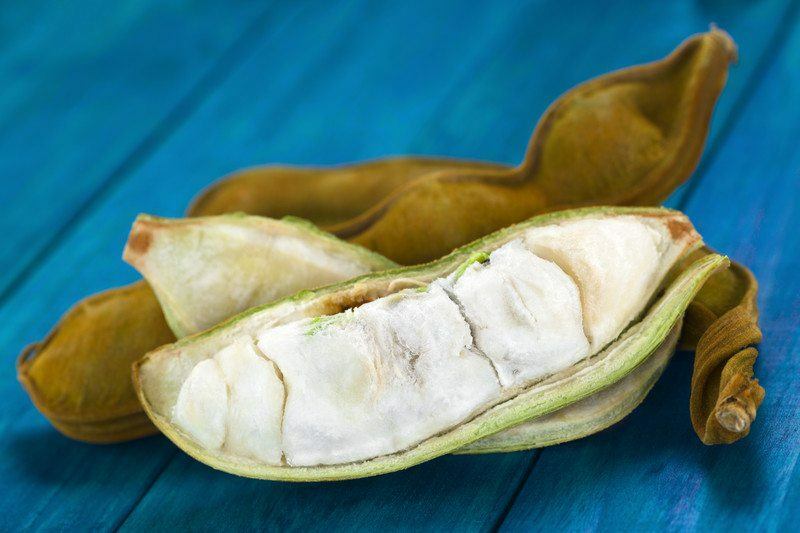 The other fruit, which really impressed me, was the ice cream bean, also known as pacay. The first time I saw this fruit was in the famous restaurant called Centrale. It's one of the most popular restaurants in the world, and you normally have to make a dinner reservation 4 months in advance. Well, I snuck in at lunch and found a spot. Lucky me! One of the courses was an ice cream bean. Then I continued to travel, and had it for breakfast again at a small hostel. There, it cost me about $0.20 for three beans. The consistency is a bit weird, but delicious. It looks like a styrofoam packing peanut, but has a cotton candy texture. It's sweet, but not overly so. It kind of squishes in your mouth similar to cotton candy as well. Continue the official list of the original 66 fruits on the next page! That’s a great idea! I’ll see if I can find a picture to use on my site. 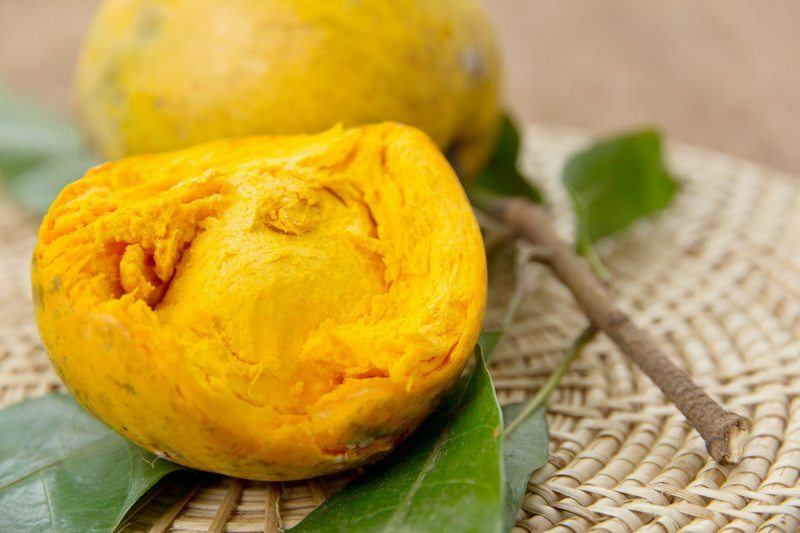 Cupuaçu is commonly known in the production of delicious mousses, creams and juices, rich in flavors in Brazil. Chocolate from cupuaçu isn’t what it is really acknowledged for. Cashew apples–common in Brazil, very sweet and often made into a juice. They’re extremely perishable, so you’ll rarely see them in markets away from countries where they’re grown. Lemon guavas and the closely related strawberry guavas–related to regular guavas, except these fruits are small, about the size of a cherry. Lemon guavas have a complex citrus (almost vanilla-like) taste, but strawberry guavas can be a bit sour. Babaco–this is a type of papaya from the mountains of Ecuador. This does not taste like a papaya but instead tastes like a cross between a pear and a pineapple and has yellow-white flesh. White sapote–much different from a black sapote, this southern Mexico fruit looks a little like a green apple at first glance, but is very creamy and white on the inside. The taste is kind of a cross between a pear and a banana. Also, there are palms other than dates and coconuts that have edible fruits, such as the jelly palms (good for jelly as the name implies but not so much as fresh fruit) or the peach palm fruits (starchy and bland, doesn’t taste like a peach, best for cooking). Hey, I know it’s hard to find pictures, so don’t mind me if you just couldn’t. But, are you aware that the picture under “saguaro” is actually a picture of a compass barrel cactus (ferocactus wislizini)? I don’t know if you can use them on your website or not, but Wikimedia Commons does have some pictures of saguaro fruit. Other than that, this was a great and interesting post. Thanks for making it! Thanks for the catch! Sometimes photos are mislabeled, and you are correct, I had the wrong photos. I’ve updated them to reflect the correct fruits! Wow, and a great new source, too! I learned like five things today (about a cactus that surrounds me, and that I study), so thanks!